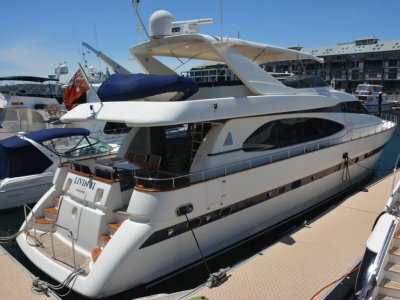 2002 Grand Alaskan 24M Long Range Motor Yacht, Raised Pilothouse, in NZ Commercial survey, four ensuited cabins, highly specified, perfect for extended trips away in self sufficient luxury, or simply continue the successful charter business. 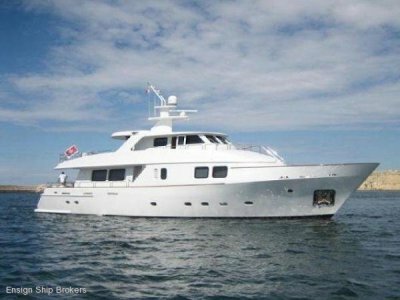 Hale Kai II" is a Grand Alaskan 78' long range Atlantic capable motor cruiser a traditionally styled raised pilothouse yacht with luxury accommodations and teak interior in excellent condition. 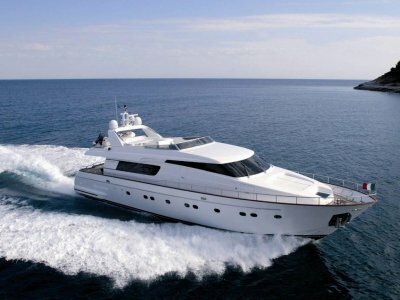 Having been specified by the owner for his use as a family cruising yacht and professionally maintained since delivery. The owner also requested a quiet ship, increasing the service battery bank to allow extended ship's power without interruption of running machinery. 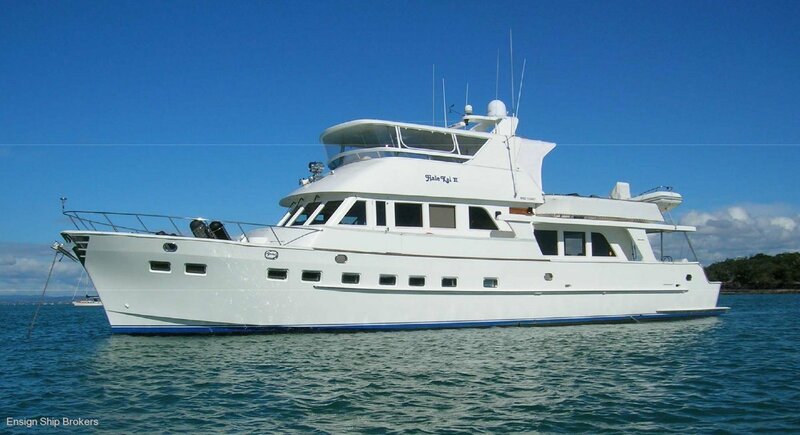 The yacht was customised to accommodate a 4 cabin layout, with 4 private head/showers. The layout is well balanced and well thought out for extended cruising.. 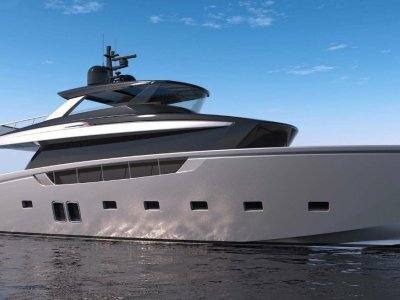 Whether cruising the shallows of private anchorages, diving in unique locations, or cruising offshore in stabilized comfort, "Hale Kai II" will provide exceptional performance and safety in a beautifully styled. Call E S B Main Beach now for more information or to book an inspection. SALOON: The salon opens aft to a spacious covered aft deck dining area and steps down to the aft cockpit. There is access from the aft cockpit through a watertight door into the crew accommodations and engine room, as well as through an opening door aft to a 3' molded bathing platform. The main Salon includes all teak furniture with an L- shaped sofa, recliner chair and 42" Plasma TV visible in either static low position or elevated. Interior is teak throughout, decorated in classic style, with teak and holly floors in some areas and beige carpeting in salon and master suite. Custom interior layout is designed to allow privacy in the owner's suite which is accessed from the main salon aft with a staircase. There is also a passage through owner's wardrobe from guest staterooms. cabin with ensuite head/shower, plus two large double cabins with over/under accommodations and ensuite head/shower in each. The owner of Hale Kai II has a large family with children and wanted to have access from his cabin to the guest areas. The Owner's Suite is full beam with king size berth, vanity bureau, large wardrobe and double sinks in head with separate shower. Each cabin has Cruisair A/C control. Crew quarters for 2 crew are aft of engineroom with 2 single berths, washer, dryer, full head and shower. Access is through aft cockpit door or engineroom. Separate forced air A/C system in Crew area. LAYOUT: The Galley is forward of the Main Salon and a few steps up on the pilothouse level, equipped with all GE Profile appliances. Out board double sinks and beautiful Pearl Blue granite counters. A day head is forward of the galley. New Zealand Registered Ship No. NZ1928. Commercial Charter Registration No. MNZ 133697.